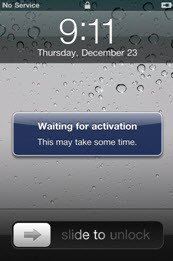 Follow the steps below to activate iPhone 4. Contact backup must be performed prior to activation of iPhone 4 or contacts may be lost. Refer to the Verizon Cloud website for step-by-step instructions on how to install the Verizon Cloud app and back up contacts on your existing Verizon Wireless device. You can sync and transfer contacts and other content from your current iPhone to your new iPhone 4 with iTunes. For more information about syncing and transferring contacts with iTunes, refer to the Syncing with iTunes page. Check with your existing wireless provider for contact back up options on your current device. If you already keep your contacts on your Mac® or PC, you can use iTunes to sync them to your new iPhone 4. iTunes syncs contacts with applications such as Mac OS® X Address Book, Yahoo!® Address Book, and Google Contacts on a Mac, or with Yahoo! Address Book, Google Contacts, Windows® Address Book (Outlook® Express), Windows Contacts (Vista® and Windows 7), or Microsoft Outlook 2003, 2007, or 2010 on a PC. iPhone 4 can also sync your contacts over the air using MobileMe or Microsoft Exchange. If your current device cannot sync contacts with any of these options, you may need to re-enter your contacts on your new iPhone 4 manually. If you have the latest version of iTunes, launch it and log in to your Apple® account. Otherwise, download iTunes from the Download iTunes Now page. After downloading, ensure you have an Apple account. If you do not have one, follow the on-screen instructions to create one. Turn on your new iPhone 4. Connect iPhone 4 to your computer using the included USB cable. Review the Verizon Wireless Customer Agreement and click I Accept to continue. Follow the on-screen instructions to activate iPhone 4. Tap the Phone icon on your iPhone 4. Tap the Voicemail icon and click Set Up Now. Follow prompts to set up your voice mailbox password and greeting. Tap the App Store app on iPhone. Enter Verizon Cloud in the Search field. Tap the Verizon Cloud app and tap Free to download to iPhone. Once downloaded, tap the Verizon Cloud app on the Home screen. Refer to the Verizon Cloud website for step-by-step instructions on how to restore contacts and other content. Apple, iTunes and iPhone are registered trademarks of Apple Inc.